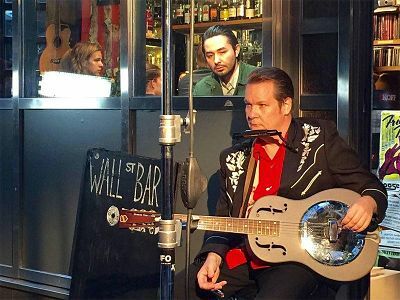 Has the modern-day master of deadpan humor, Finnish filmmaker Aki Kaurismäki (Leningrad Cowboys Go America), turned serious on us? The answer is both yes and no, as his delightfully low-key comedy/melodrama The Other Side of Hope makes abundantly clear. The basic subject matter of the film is serious – the plight of Syrian refugees in modern Europe. But lest you think that the man who made the delightfully charming immigration tale Le Havre — not forgetting the broadly comedic culture-clash “Leningrad Cowboy” trilogy — has “gone all Spielberg” and made a message picture, never fear. This is a very amusing and touching film. The Other Side of Hope contains parallel narratives that both focus on characters “starting a new life.” The first protagonist is Khaled (Sherwan Haji), a Syrian refugee who, through a complicated chain of events, winds up in Finland, where he hopes to find a new job and discover what happened to his sister, who was apprehended shortly after she left Syria. The second lead is Wikstrom (Sakari Kuosmanen), a traveling salesman who opens a restaurant that needs to find a steady clientele. Khaled’s storyline is quietly serious, while Wikstrom’s is filled with classic deadpan humor. When the two characters finally meet (and wind up in a fistfight), the two different tones intertwine, and Hope becomes a very special creation indeed. For, as different as they are, the men are two sides of the same coin. Both are trying to shed their old life, although Khaled is clearly in a place of danger, whereas Wikstrom knows how to game the system (most literally in a scene where he gets the money for his restaurant by reverting to one of his skills — championship poker playing). The most important theme of the film is the brotherhood between immigrants and outcasts. Khaled bonds with young men from other Middle Eastern countries while he resides for a time in a “reception center” for immigrants. The flip side of this is that Wikstrom and his circle are uncommonly friendly and humane (although they remain classic Kaurismäki characters — smoking, drinking, and listening to sad old songs in bars). Kaurismäki thus shows a clear connection between the working-class characters he’s spent the last 35 years depicting on film and the latest outsiders in Finland, namely refugees. And just to show that his latest “fable” about outcasts isn’t devoid of real danger, he includes scenes and dialogue that acknowledge one of the biggest threats facing immigrants, namely the neo-Nazi skinheads who will beat them, not knowing (or caring) where they come from. The three video supplements included in the package are nearly as moving and amusing as the film itself. One featurette explains the film’s onscreen dedication to critic Peter von Bagh. Kaurismäki and von Bagh were good friends, and von Bagh wrote several articles and a book in Finnish about the filmmaker. One of his articles, “The Comedy of Losers,” is thus read with appropriate scenes from Kaurismäki’s movies as punctuation. A newly conducted interview with actor Sherwan Haji finds him discussing Kaurismäki’s technique with actors and his own odyssey from Syria to Cambridge (where he studied film and TV production) to Finland, where he moved because of a romantic relationship. Haji also details how Kaurismäki quickly added a new scene after he learned that Haji plays a Middle Eastern guitar-like instrument. The piece de resistance here, as it was on the Criterion release of Le Havre, is a video of Kaurismäki and company at a film festival press conference (in this case, it’s the Berlin International Film Festival). This time Kaurismäki is surprisingly serious, discussing the subject of refugees in Europe with a great deal of earnestness. It’s a hitherto hidden side of the filmmaker, but Kuosmanen changes the tone when he, at Aki’s invitation, sings an entire song in Finnish to entertain the assembled press corps. Cheers for this grand review of a rare, marvel of a picture.